Kopter is embarking on a 20,000-square-meter expansion of the company’s existing footprint at the airport in Mollis, Switzerland. In preparation for serial production of its SH09 and following approval by the municipal assembly, Kopter is embarking on a 20,000-square-meter expansion of the company’s existing footprint at the airport in Mollis, Switzerland. Design details and the building’s layout should be completed this summer with construction to begin in the fall, according to Kopter. Architects Dima & Partner were chosen to design the building, which will house pre-assembly of the SH09. “We are very pleased with the appointment of Dima & Partner, a well-known local partner with national and international standing, to build our new, state-of-the-art facility, which will allow us to work in the best conditions and to serve our customers worldwide,” said Andreas Löwenstein, Chief Executive of the Kopter Group. After moving into the new building in 2021, Kopter will have the capacity to ramp up SH09 production. The new building is planned for manufacturing and pre-assembly and will include the production of dynamic components such as rotor blades, gearboxes and rotor heads. Testing rigs and a central warehouse will also be located at this site. Kopter already owns an existing 4,200-square-meter building at the Mollis airfield, which will then host the final assembly lines and administrative functions. Kopter expects to achieve an annual production rate of 50 helicopters in Mollis in the next five years, which will lead to an increase in the number of employees from 100 today to around 400. This new facility will establish the Mollis site as the company-wide competence center for production, assembly, flight-testing, training and maintenance for the SH09. The site also will manufacture up to 150 further prefabricated sets of subassemblies that will be supplied to the final assembly facilities planned in the U.S. and Asia. Kopter has about 65 SH09 aircraft under either firm contracts or letters of intent to buy that will turn into commitments once certification is reached, Loewenstein told a few reporters Oct. 15 before the Helitech International conference in Amsterdam. Orders announced at the conference bring that total to 70. 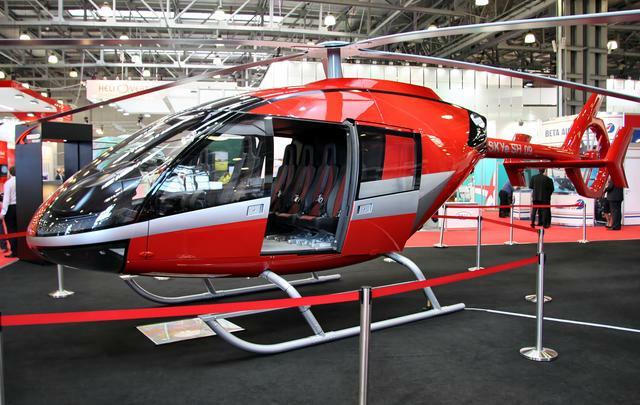 The company is seeing enough demand for its developmental SH09 multirole helicopter that company officials are planning to build hundreds of them annually within four years of gaining certification. Kopter has three SH09 aircraft cleared for flight test — P1, P2 and P3 — that are undergoing an intensive flight test campaign in Sicily. Meanwhile, Kopter is finalizing the preparation of the next prototype, the pre-series No. 4 (PS4), which will join P3 in 2019.